Float is a fun summer read about boys being boys, but some of the reviewers had a problem with that. 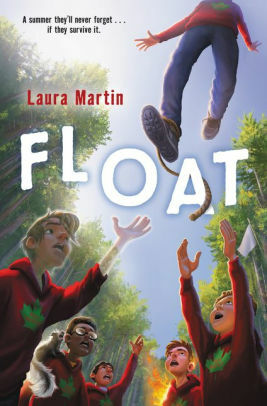 The protagonist of Float, by Laura Martin (HarperCollins, 2018) is a 13-year-old boy classified as a RISK—that is, one who is afflicted with Recurring Incidents of the Strange Kind. Emerson is RISK Category 5 because of his tenuous relationship with gravity: unless anchored by iron shoes and a weighted vest, he could float up to the stratosphere and no one would ever see him again. Now that he’s become a teenager he’s advised to attend Camp Outlier, a two-month government-sponsored program for other RISK-y kids. There he meets Hank, who turns invisible without warning; Anthony, who spontaneously combusts; Gary, who sticks (and has a bad attitude), and Zeke the X-ray vision kid, along with Zeke’s service animal, a de-scented skunk. Murphy is the most mysterious of the lot. He time-travels, and one of his unexpected jaunts into the future reveals a danger that will drive the plot and mold the misfits into a band of brothers. Kirkus can be a little quirky this way–the first review journal that consistently identifies major characters in children’s novels by race. This particular reviewer may be right about social change, even though I disagree with her terminology. I think of “patriarchal” as men dominating women, but we don’t see that in Float. The girls are in no way harassed or intimidated; instead they are admired from afar, and they seem fully capable of holding their own. If it were their story they would undoubtedly come across as more than “props.” But what the reviewer means by patriarchy, apparently, is simply boys acting like boys. Is that a thing of the past? We’d better hope not, but increased hand-wringing over “toxic masculinity” may result in Men without Chests. I can’t believe that Kirkus review. Good on you for pointing it out and telling us the actual truth about the book. This is why I consistently trust the reviews from Redeemed Reader. In a culture that is losing it’s mind, I know you will still be a light helping navigate the world of children’s books. Thank you! I found it hard to believe myself. That’s the way the elite culture is drifting, but it’s hard to say how far it will go.